Naralim picks up right where Walking with Monsters ended. Ellie and Vincent have accomplished their mission. They have rescued Michael, Ellie’s brother, from the Foundation’s lab. But he has been changed, infected with the same virus that has made Vincent into a unstoppable killing machine. But that’s the least of their problems. During the breakout, Ellie freed more than her brother. Now other monsters our on the prowl, deadly and dangerous creatures that hunger for human flesh. But before they can correct her mistake and round up these creatures, they need to deal with Reese. Vincent’s brother Reese, also transformed into a monster in WWII, is looking for vengeance. Vincent burned him a live sixty years ago, leaving Reese in agony until he healed. Burning his brother drove Vincent mad, and Ellie doesn’t want that to happen to the monster she loves again. So she has a plan. A dangerous, deadly plan. It’s an Ellie plan, so what can go wrong? 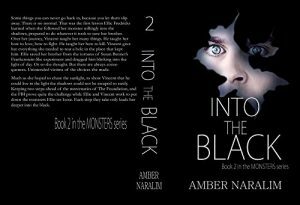 Into the Black is a great follow-up to Walking with Monsters, expanding the world’s mythology and exploring more about the background of Vincent and his brother. The book is a fast paced thriller, full of twists and turns and romance. Naralim blends realistic violence (our heroes do not get through gunfights unscathed) and supernatural horror together to make a wonderful tale. I eagerly await to see where she is taking this series next. If you’re a fan of Urban Fantasy, with a touch of horror and plenty of romance, then check out Naralim’s Monster series. You will not be disappointed. You can buy Into the Black from Amazon.